After writing my article on how to obtain an E2 Visa for the USA, I've had quite a few enquiries about visas. This article is about the B1/B2 Visa, it's ideal for those who want to stay longer than the 3 month granted to a tourist. The "B" means "Business." It doesn't mean you can set up a business in the USA, but you can visit and promote your business (the one in your home country), visit suppliers, etc. The B1 is for the "business" person and the B2 is for their spouse and family. The B1/B2 is a 5 year visa that allows stays upto 6 months, with the possibility of extending to 12 months. Thankfully it's easier to get than an E2. As a simple and rather obvious disclaimer, I am not a lawyer or immigration professional. This is not advice. It’s information from my own experience. Use at your peril (or benefit). 1. Get your passport photo taken, a digital version. 2. Complete the DS-160 Application form (https://ceac.state.gov/genniv/). You will upload your photo as part of this process, and they'll let you know if your photo is acceptable. 3. Complete a profile at www.ustraveldocs.com, this is also where you pay the application fee and schedule an appointment. It can take 2 to 3 weeks to get an appointment. Note: the ustraveldocs.com website is shocking. Be prepared to be kicked out several times (like 20 or more) until it actually works. I think it might be part of the filtering process. Keep out those who are not very determined. The interview process is the same as an E2, with the main difference being the types of questions they ask you. The assumption is that you intend to violate the B1 and try to stay in the USA in some way, so the main focus of the interview process is providing enough proof and certainty that you have ties in your home country and intend to return. It’s a case of assumed guilt and the need to prove your innocence. You go through airport-type security, surrounded by guys with guns. Your passport is checked 3 times before you take a seat and look at a wall. Your phone and belongings are confiscated. You are told to sit and wait until you are called. I think the purpose of this stage is to make you feel intimidated. It works. You are escorted by security guards to the interview room. First, you have to hand over your passport (4th time) though a thick plated glass window. Once verified that you are the same person on your passport, you are permitted to go through a security door and join the queue. Behind a thick window sits a person who you converse with via a speaker. You hand over passports again (5th time). I was asked the name of my business, which I remembered without too much trouble. You are digitally fingerprinted, both hands. Then you are told to take a seat and wait for your name to be called. Hand over your passports again (6th time). You'll be asked questions about your intentions to stay, what ties you have to your home country. They want to see proof that you will return and not violate your visa by overstaying. It costs $160 USD per person to get the visa added to your passport. You hand over your passports to the interviewer. They'll courier them back to you within the week. The entire process was perhaps an hour. The actual interview is a few minutes. BONUS! 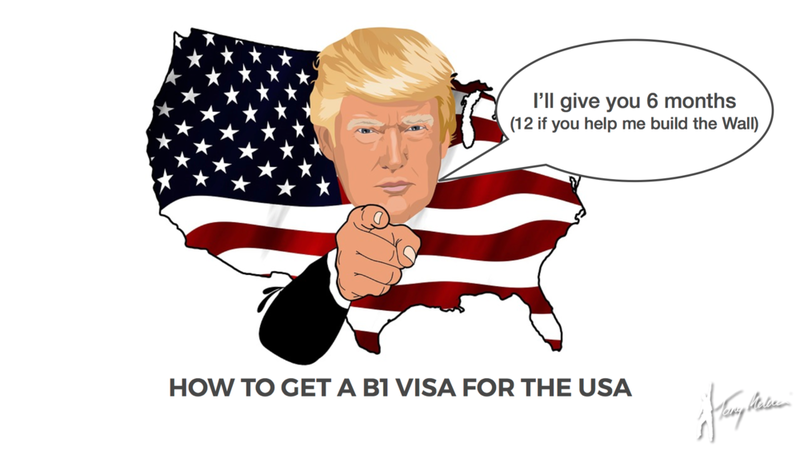 Once you have your B1/B2 Visa, you can renew it via mail and avoid the interview process. Older PostDid You Know Debt Is Negotiable?